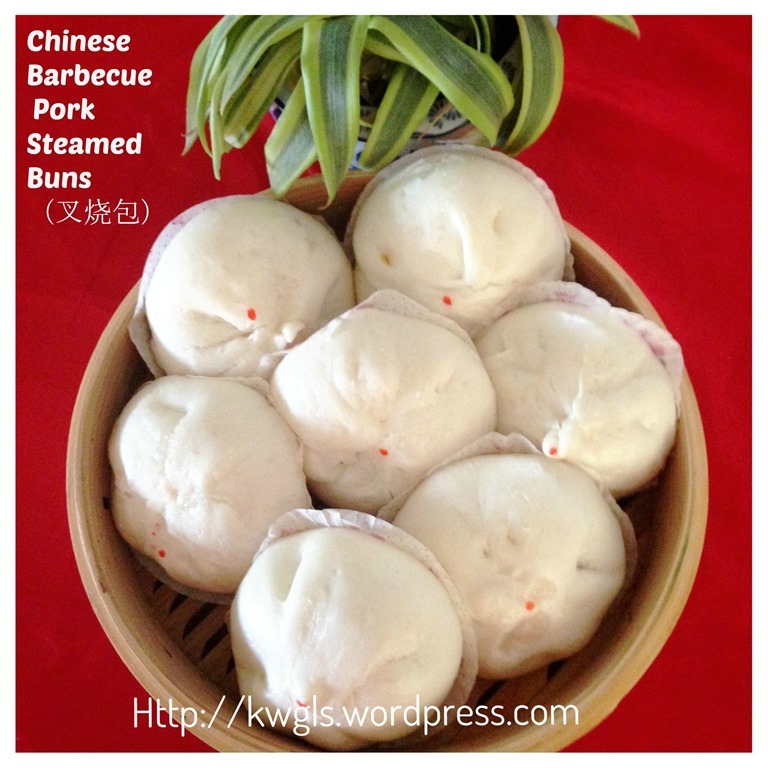 Frankly speaking, I never expect my Char Siu Bao (or barbecue pork steamed buns) were so big. It shocked me actually. 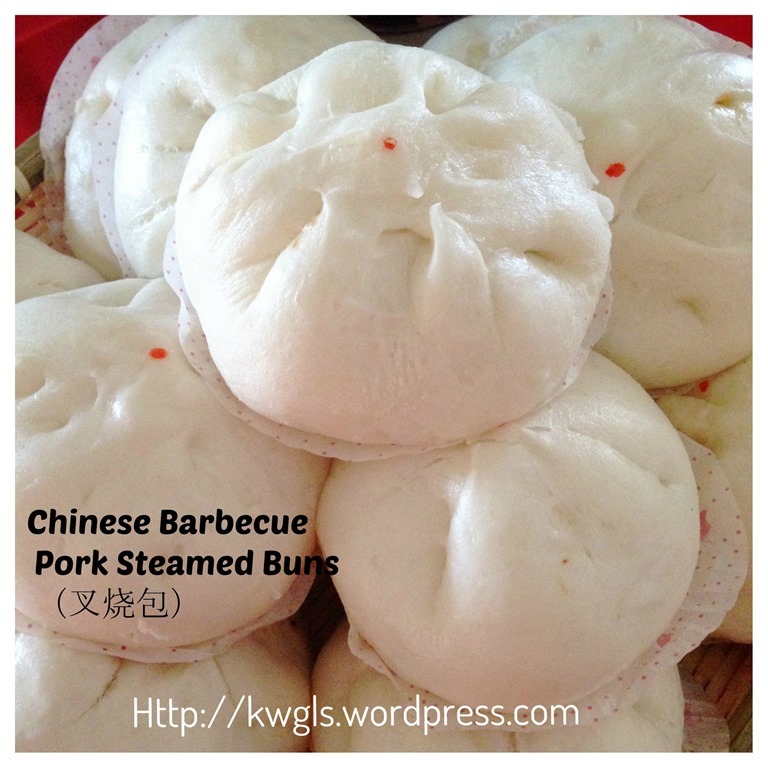 I expect it to be a cute little buns like at least 50% similar to those in the dim sum restaurant. When I opened my steamer cover, the buns have increased by about almost 100%and most of the flower design became not obvious. I roughly knew the reasons. It could be due to the adequate proofing time and the use of double acting baking powder instead of the normal baking powder. .In addition, it is because of the weightage of the dough. While for a small Char Siu Bao, the dough shall be about 30 grams but as my hands are rather big, I have wrapped using 60 grams of dough and this is the dough that is just nice for the wrapping . A few points can be concluded from such definition. It is leavened using both yeast and baking powder. In fact, for smiling Char Siu Bao like those in the Hong Kong Dim Sum restaurant, another ingredient is needed – ammonia bicarbonate. A type of leavening agent that will produce carbon dioxide when heated and hence giving the dough more air and a fluffier texture. 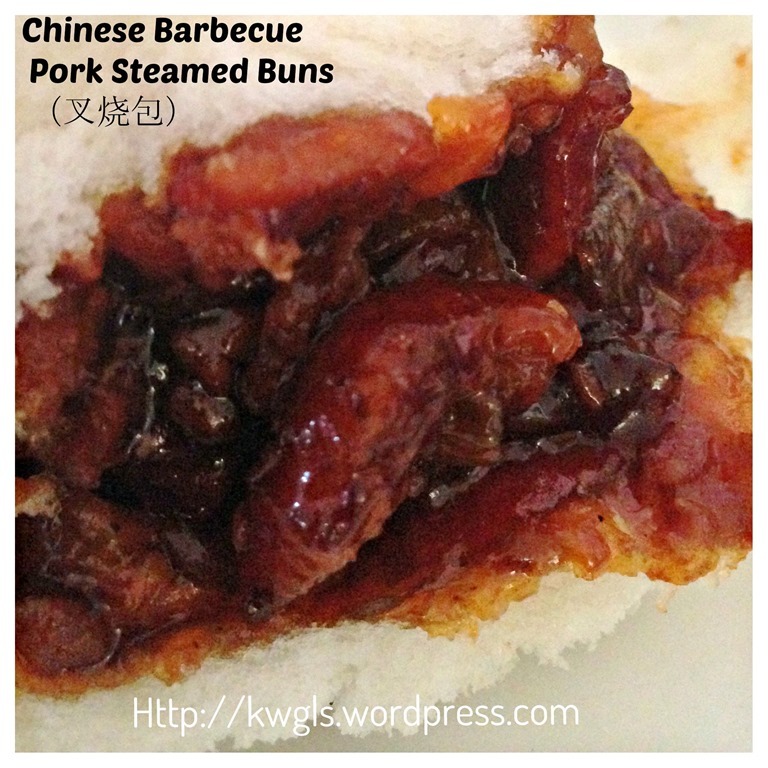 Secondly, It is usually seasoned with oyster sauce, some wine, sugar, dark soya sauce. and corn starch. 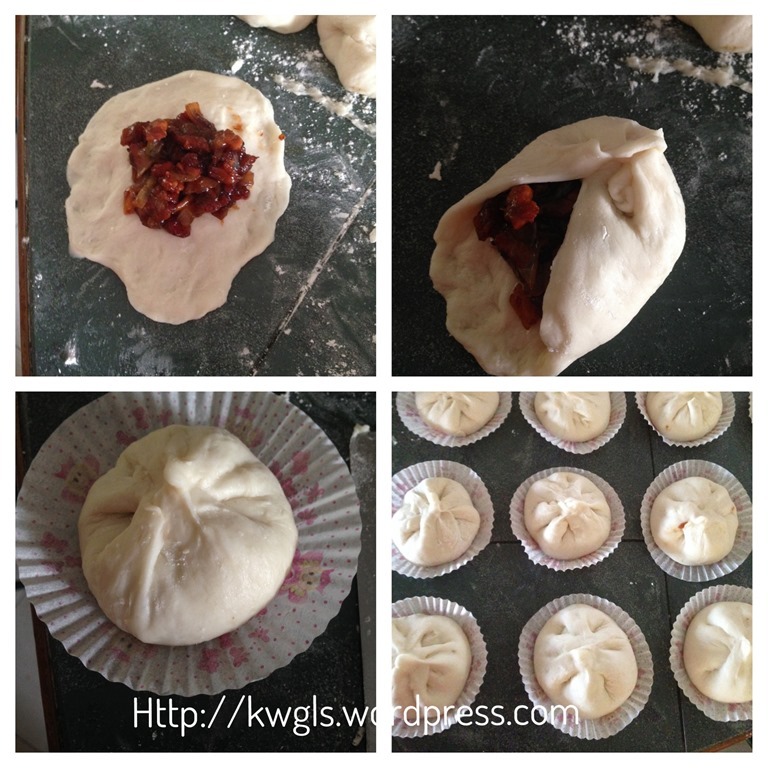 Preparation is not very tough but patience is needed for the proofing the dough.The buns will have a very soft texture as a result of adequate proofing period. As for the filling, I have purposely limited the use of too many seasonings. Basically just oyster sauce and sugar. Most other ingredients can be omitted if necessary. 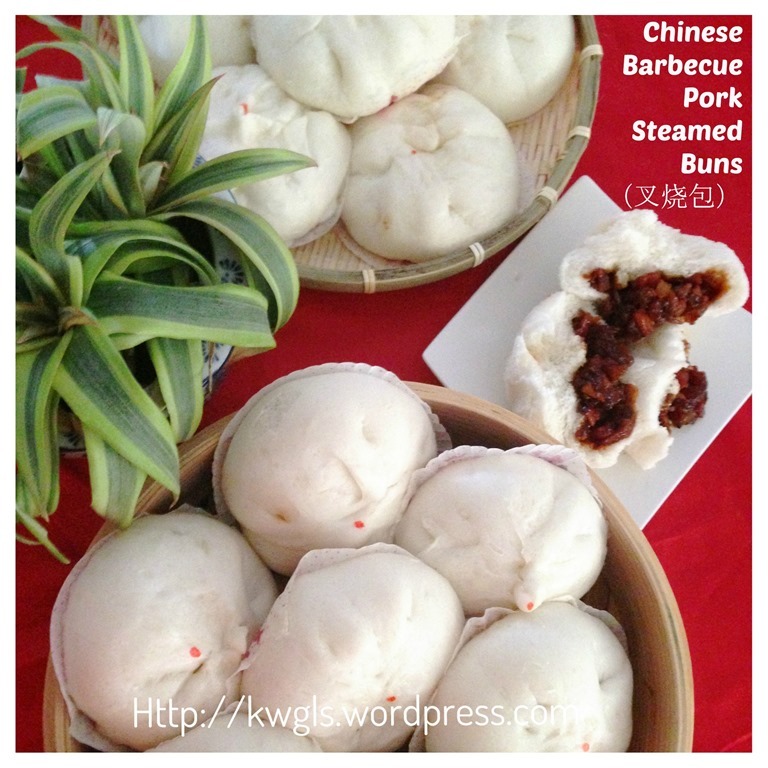 Serving : About 20 steamed buns depending on the size. Put all dry ingredients (A) in a whisking bowl. Use a spoon to stir the dry ingredients and make a well in the centre. Add in the lukewarm water and oil. Use the same spoon to roughly stir it until it form a sticky dough. Use the machine dough hook to knead the dough for another 15-20 minutes or until the dough looks smooth and leaves the side of the whisking bowl. If the dough is too wet for the kneading, add 1-2 tablespoon of flour to continue. You can also do this manually if you don’t prefer to use the machine kneading. In a flat surface, dust with some flour, transfer the dough to the flat surface and knead for 3-5 minutes until the dough does not stick to your hand. Shape it into a ball, put it in a bowl. Cover with a wet towel or clingy wrap and let it prove for 30 minutes (or double in size) whenever is earlier. Note that this is a rather soft dough. 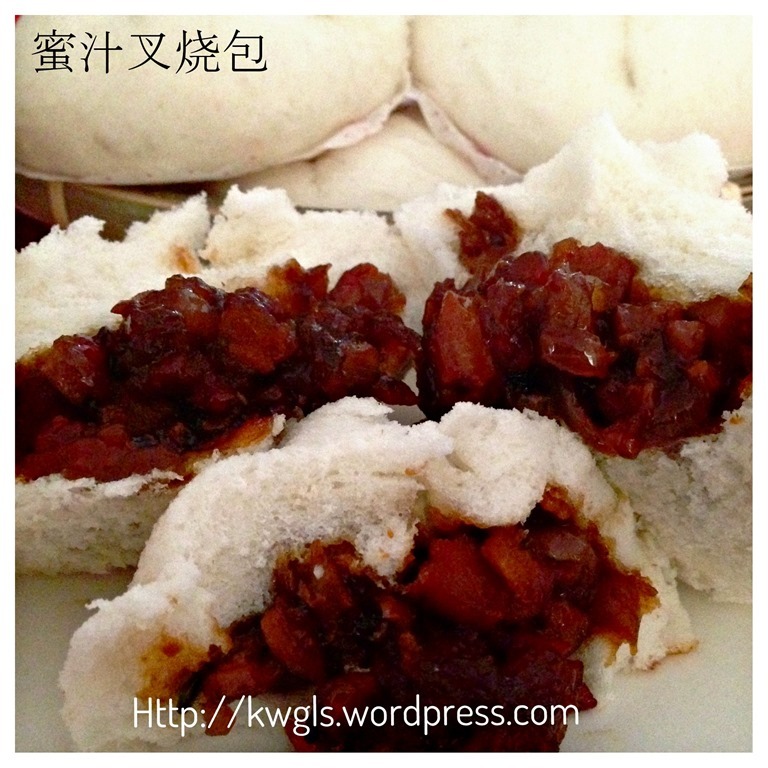 As such, do add some plain flour or bao flour if it is too soft for you to handle. Once ready, divided the dough equally. 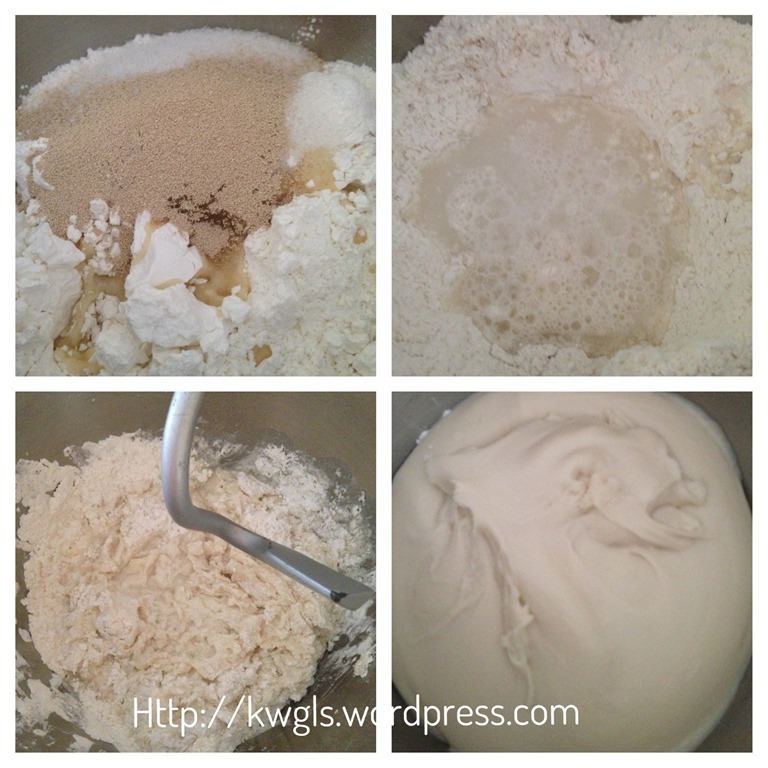 Suggested dough size is from 30 grams to 60 grams. While the dough is proofing, get ready the ingredients for the fillings. 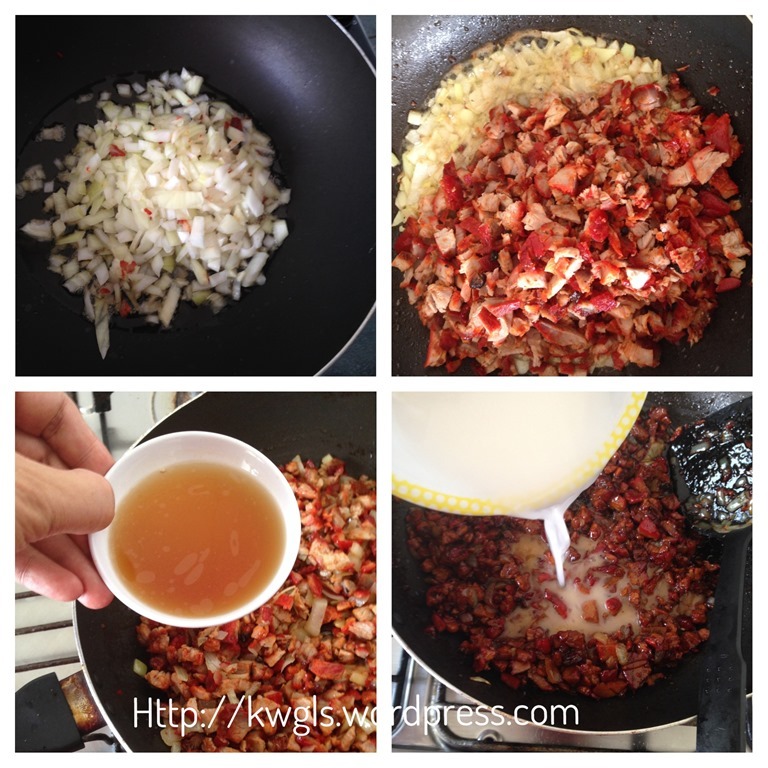 In the frying pan, add 4 tablespoons of cooking oil, sauté the onions until fragrant. Add in the barbecue pork and stir fry until well mixed which took about 1-2 minutes. 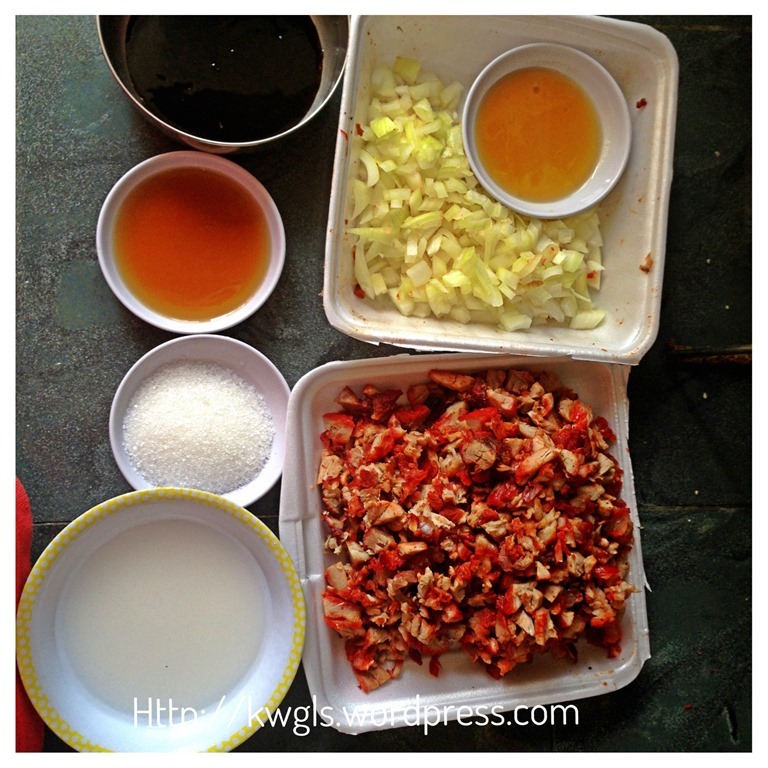 Add in the cooking wine, oyster sauce, sesame oil, sugar, oyster sauce and dark soya sauce. Stir fry for another 2 minutes. Add in the starch solution and off the heat when the starch solution turns transparent. If it is not sticky enough, add in more starches. 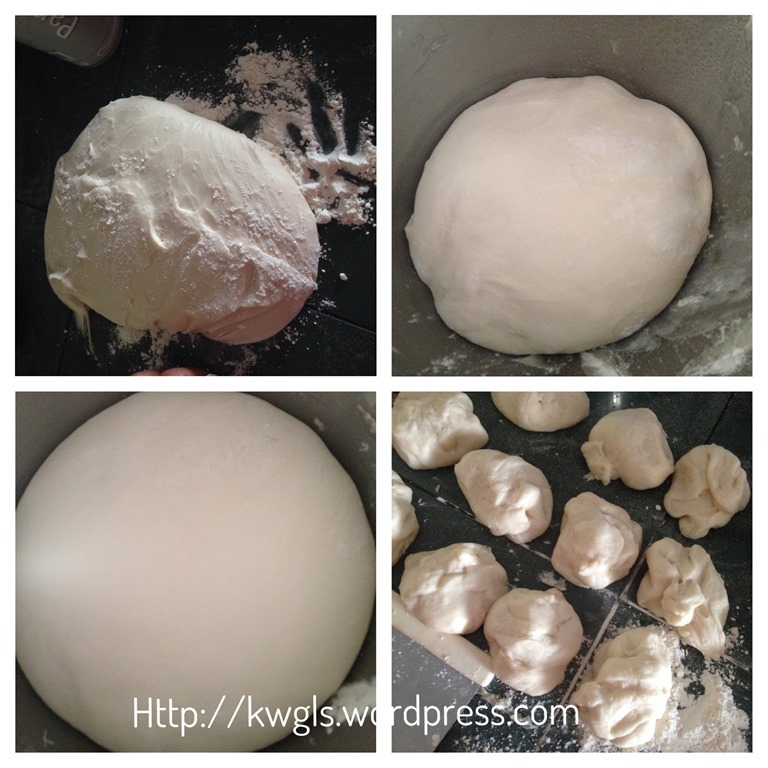 Divide the dough with your desired sizes. For standard size, it is about 30 grams of dough. However, for this illustration, I am rather uncomfortable with 30 grams and my final comfortable dough volume is about 60 grams. Take a dough, shape round and flatten in a surface dusted with more plain flour or corn starch or bao flour. Put 2-3 teaspoons of filling in the centre. Seal the edges and put on a piece of cupcake cups or square baking paper. Let it proof until it is almost double in size. Once the proofing time have reached, get ready a steamer full of water. 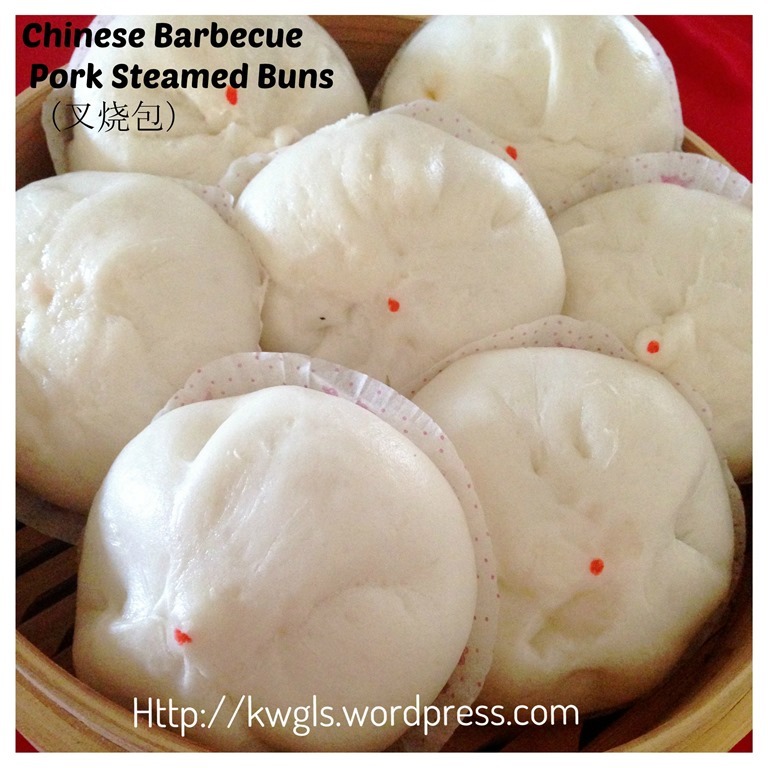 Bring to boil and steam the buns in the steamer under high heat for about 12-15 minutes. Once ready, let it sit in the steamer for 5 minutes before open the cover. Best served hot as a snack item. Not something very difficult to prepare. 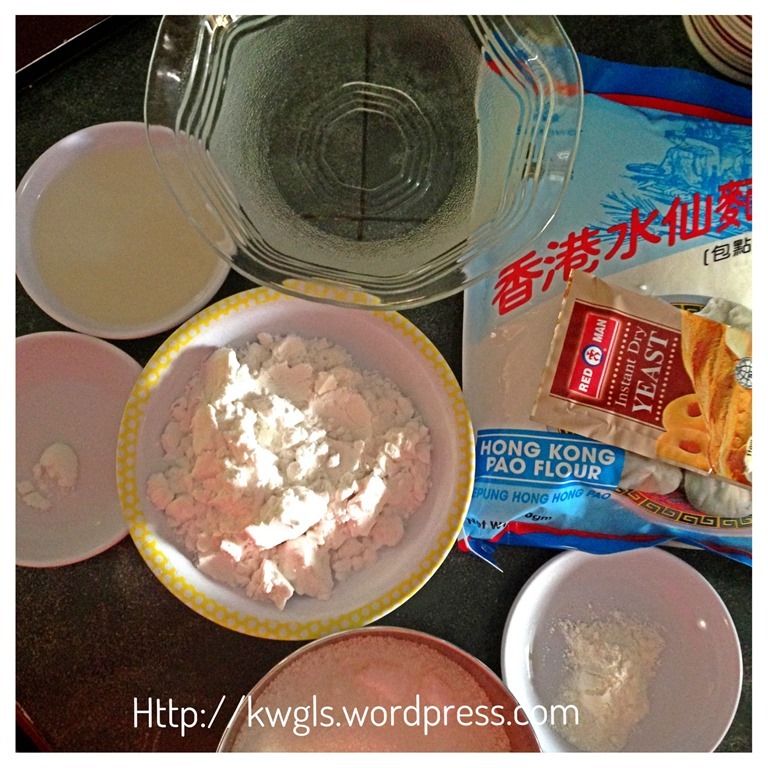 Remember to use the bao flour, a type of specially bleached flour for the white colour. Due to my big hand, my Char Siu Bao is also rather big.. ha-ha. I am sure all of you can handle much smaller dough than I am and come out with a cute, little, normal sized Char Siu Bao. 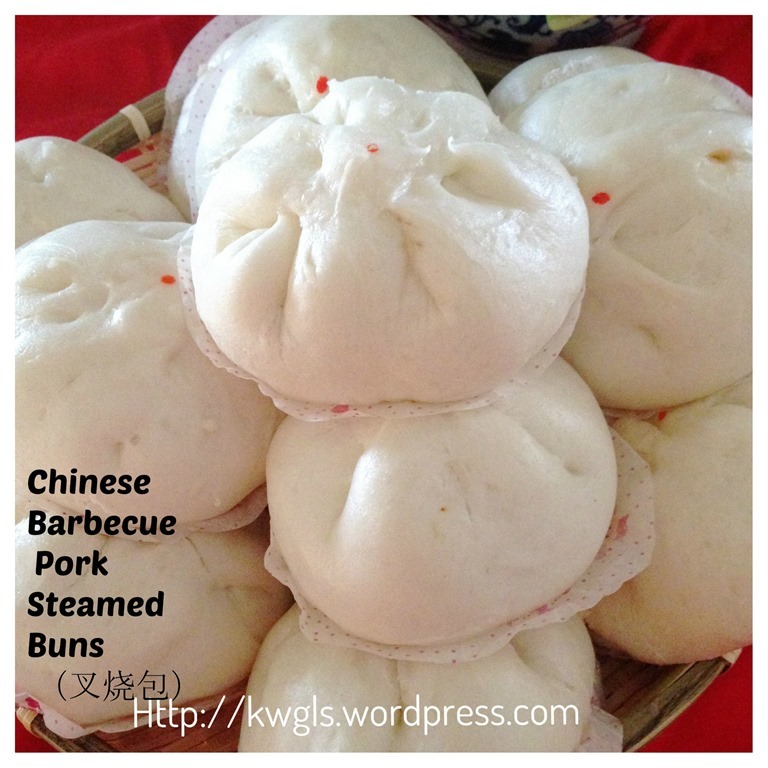 This entry was posted in Chinese and Asian Cakes and Snacks, Food Preparation Series, Snacks and tagged 8, Char Siew Bao, Char Siu Bao, chinese barbecue pork buns, 蜜汁叉烧包, GUAI SHU SHU, Guaishushu, kenneth goh, postaday. Bookmark the permalink. 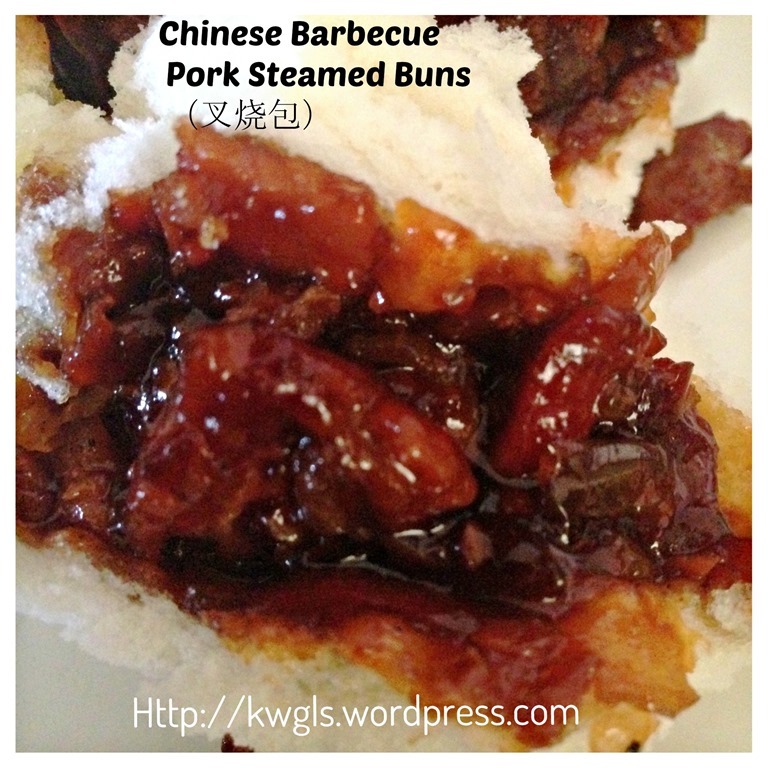 i love the look of the filling, so moist and sticky and sweet looking! I would happily eat the giant bao. They look yummy! I like big big ones!! Very nice, Kenneth! 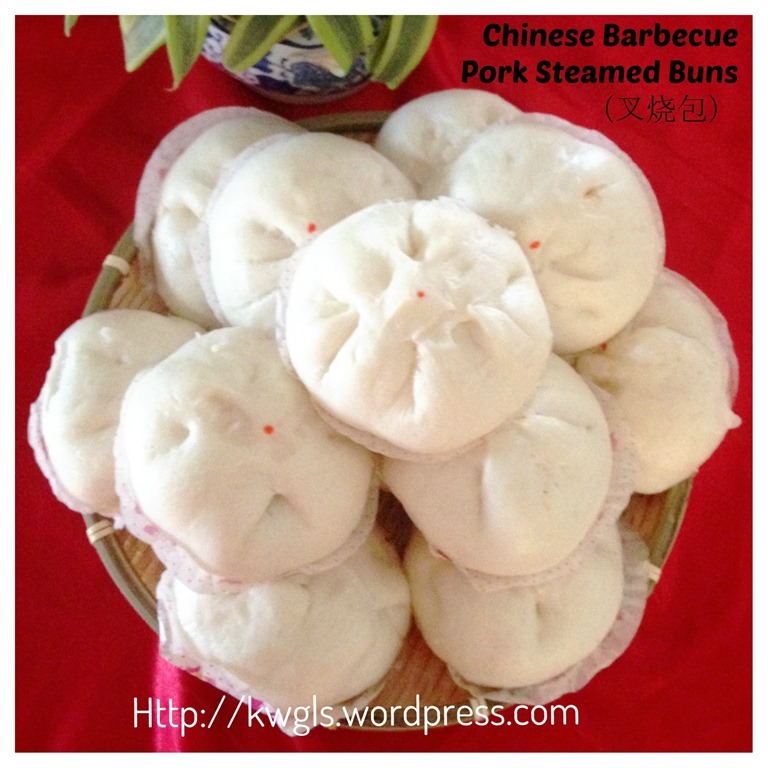 We love char siu bao and make it several times a year, but I’ve never heard of bao flour. Will look into it. Thanks for posting. It is a type of special bleached low protein flour. It make the pao whiter . I tried to make it this morning. The filling was good but the skin was kind of yellowish. 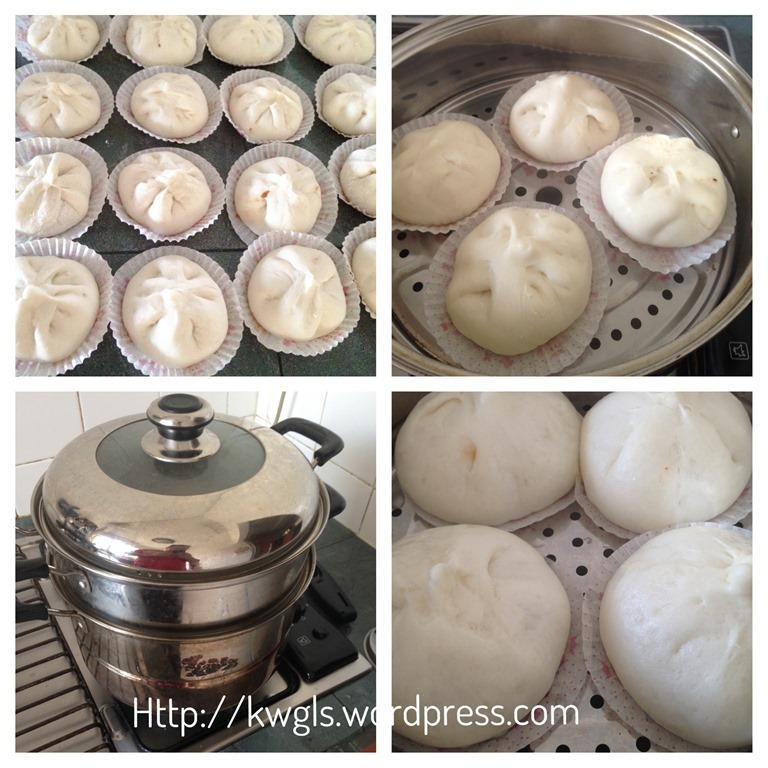 I used ready bao flour that I bought from the grocery. Not sure whether it’s low protein bleached. I suspect it could be the type of yeasts I used. ( it’s brown in colour). Should I use white yeast instead? If you have, that is the best. I am using instant yeast. But compressed yeast do give a more yellowish colour. Oil used may be another factor. Hi, just followed ur recipe but my filing turn out very dry. I have already put 5 tbsp potato startch, should i change to cirnstarch nxt time? Also the bao can place at freezer right after 2nd proof? yes. You can. Did you cover when proofing ? yeah, must cover rite? Btw i have some left over filing now, should i re-cook it? What should i add this time? Just fried it and eat with rice. The most practical . 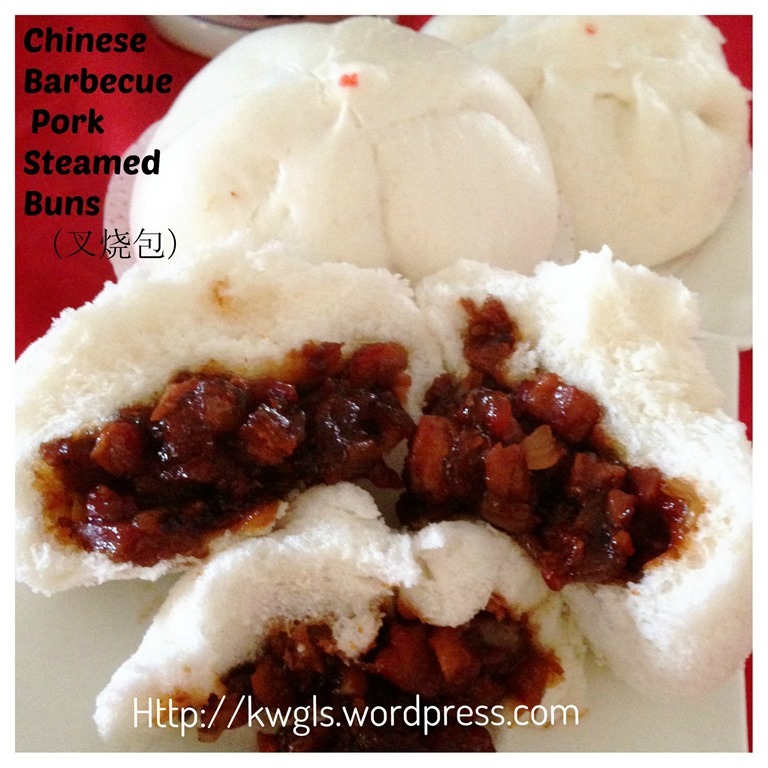 Hi, I tried to make the char siew bao. The filling was just nice but after kneading with machine for quite a long while, the batter continue to stick to the sides of the mixer bowl. It becomes very sticky. Any advise what went wrong? I did that. It continues to be sticky. In fact, it becomes starchy and elastic too. Do I continue to add more flour? The a million Sifu Ken. I will try to make the paos tomorrow. Bought the flour and yeast today n will make my own char side tomorrow. Tq, Tq again. This looks really delicious, I like it big for me that is just the right size. 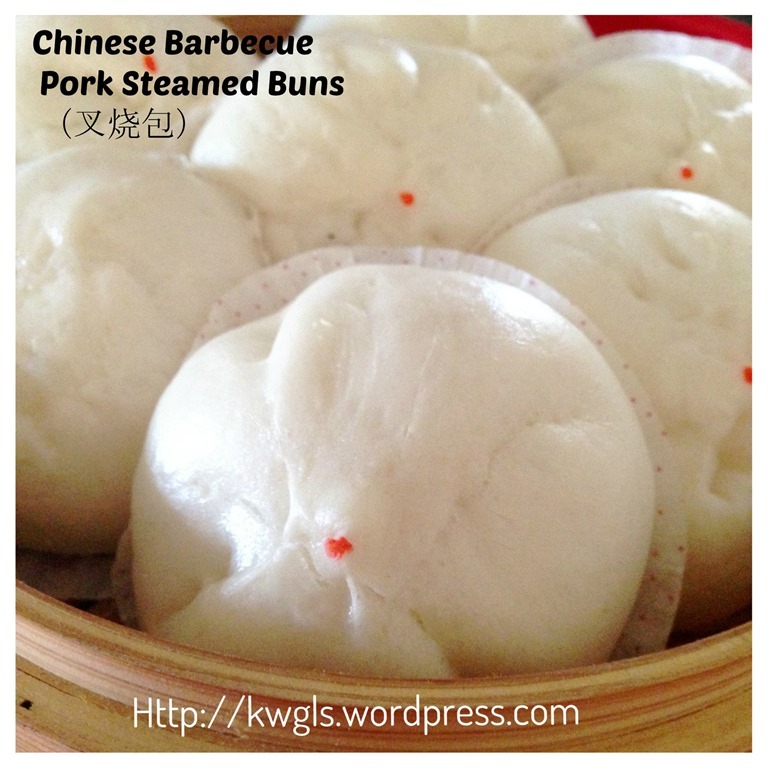 There are no dimsums to buy near where I live here in the U.S. and I doubt if I can find the barbecue pork in the groceries. I’d love to make this at home. Can I use chicken or ground pork with this? One more thing, can this recipe be baked instead of steamed? Thank you.